I believe we are smack dab in the middle of the biggest stock bear market any of us will witness in our lifetime. This colors my views on investing tremendously and creates an inherent bias. If you don't subscribe to the same view, my rants probably seem a little over the top. But when the P:E ratio is well over 100 during the worst housing market crash and bank and Wall Street wipeout since the last great generational bear market (i.e. the 1929-1932 bear) occurs, it's time to take notice. Another great credit contraction is occurring in front of our eyes and such events take more than 1-2 years to sort themselves out. Another 5 banks failed this week, the largest weekly number for the FDIC to sort out since this cyclical bear market began. There will be more - many, many more. Technical analysis is a tool many use to time investments or speculations and it is easy to get overly wrapped up in the squiggles on a chart and the indicators and what they mean. I love looking at historical chart patterns to get a sense of what's possible and what's reasonable. Since I think this is a "big, bad" cyclical bear market, I am looking for it to last at least 2.5 years (we are 1.7 years into the current bear). 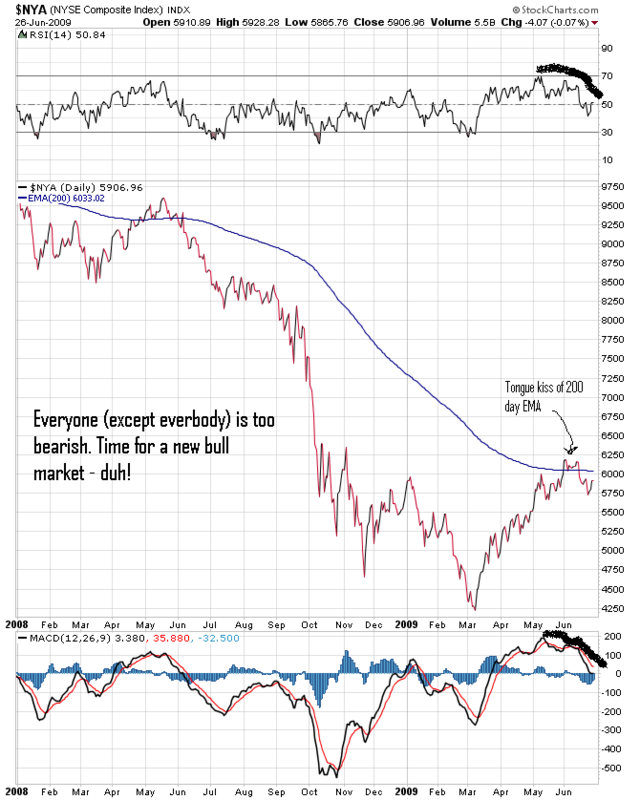 I also am NOT looking for the markets to make a sustained thrust beyond the 200 day moving average, as this hasn't occurred in prior big, bad bear markets. 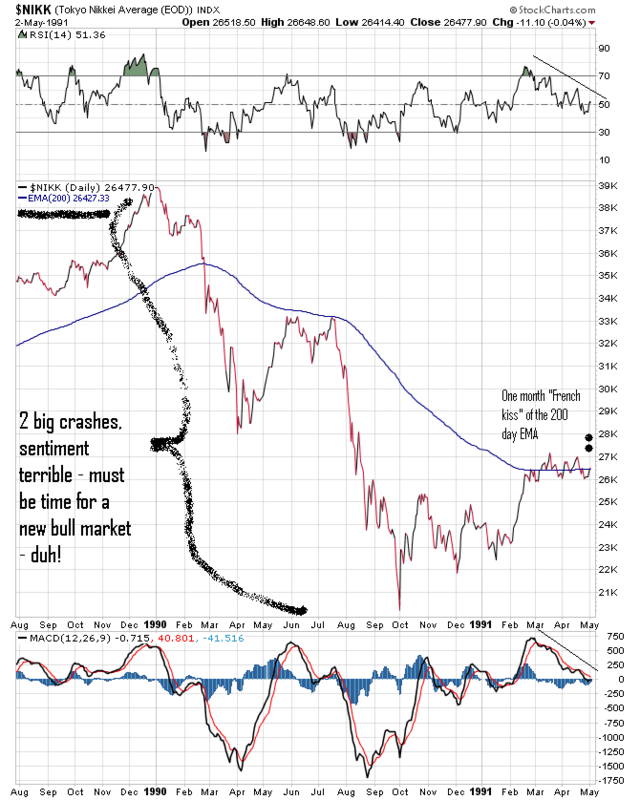 A "peek-a-boo" above the 200 day moving average can occur for a month or so, but that's about it if prior credit crunch/debt deflation bear markets are a guide. 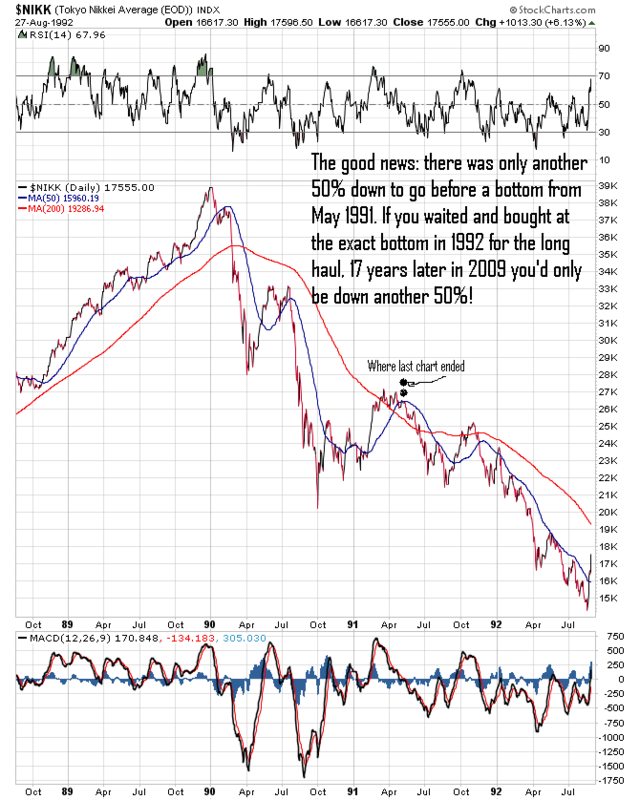 So, I am placing my money on the top in the stock market being in already and patiently (or not so patiently perhaps) waiting for another steep drop right here, right now. Not a correction and then new highs, but a full on resumption of the bear market. Doesn't look all that different from where we are right now, does it (following is a daily 18 month line chart of the New York Stock Exchange/$NYA)? Stay in the market and/or go long if you want to, but risk is heavily tilted to the downside and a July mini-panic to wipe out the gains since the March low seems pretty damn likely to me. 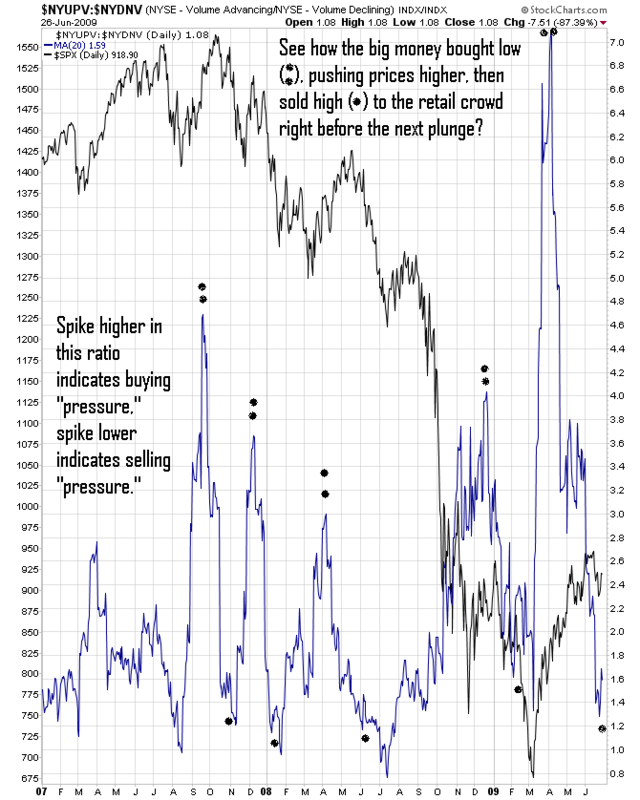 Significant new lows happen this fall, but printing a nominal new low in most of the major stock market averages before a brief late summer rally wouldn't be unusual.